Order online Bulk SMS Software Professional software to send large number of sms to mobile users using GSM Technology, Windows Technology or Android Technology based cell phones. 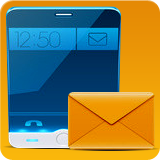 Order online Bulk SMS Software for Windows Phone to get connected to large number of users by sending sms via Windows OS based mobile phone. Order online Bulk SMS Software for Pocket PC devices to send multiple sms from pocket device to mobile phone users without requiring any hardware devices. Order Bulk SMS Software Bundle to get huge discount on professional sms software and pocket pc bulk sms software package and save handsome amount of money.